Oddish in game: 5,914 Who? Important notice! Pokemon Oddish is a fictional character of humans. Oddish (Japanese: ナゾノクサ Nazonokusa) is a dual-type Grass/Poison Pokémon introduced in Generation I. It evolves into Gloom starting at level 21, which evolves into Vileplume when exposed to a Leaf Stone or into Bellossom when exposed to a Sun Stone. Oddish resembles a blue plant bulb with a round body, beady red eyes, and oval, foot-like roots. Five large, green leaves sprout from its head. As demonstrated in the anime, these leaves are prehensile and can be used to scale vertical surfaces and catch light objects. Known by the scientific name Oddium Wanderus, Oddish lives in grasslands. A nocturnal Pokémon, Oddish buries its sensitive body in the ground during the day to avoid the sun and fool predators. If its leaves are pulled in this state, it will respond by shrieking horribly. It starts to move when its leaves begin absorbing moonlight, which it uses to grow. Oddish will wander up to 1000 feet (300 meters) during the night to scatter its seeds and find a nutrient-rich patch of soil in which to plant itself. The more fertile the earth, the glossier its leaves will be. It is thought that its feet become like tree roots while planted. In the past, Petal Dance was its signature move. 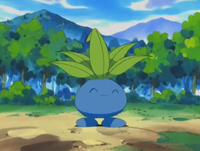 Oddish debuted in Bulbasaur and the Hidden Village as one of the Pokémon under Melanie's care in the Hidden Village. Misty attempted to catch it because she thought it was cute, but Bulbasaur attacked her, and Misty later apologized. It reappeared in a flashback in Bulbasaur... the Ambassador!. An Oddish owned by Mariah wanted to fly with its Hoppip friends in Foul Weather Friends, even trying to color itself pink like a Hoppip. Though it never flies, it still proves powerful enough to defeat Team Rocket on its own. In Whichever Way the Wind Blows, Steven owns three Oddish which he uses to study the evolution of Grass Pokémon from that area. Multiple other Oddish also appeared in the episode. Oddish are commonly found in the anime. Most of the time they play the victim and are usually being chased or attacked. A Trainer's Oddish appeared in Electric Shock Showdown. An Oddish appeared in Battle Aboard the St. Anne. An Oddish was seen in a Pokémon Center in Hypno's Naptime. An Oddish appeared in Pokémon Fashion Flash. Oddish appeared in a fantasy in Dig Those Diglett!. Oddish also appeared in Sparks Fly for Magnemite, The Kangaskhan Kid, The March of the Exeggutor Squad, The Ultimate Test and The Breeding Center Secret. An Oddish appeared in A Chansey Operation. James's fiancée, Jessebelle, had an Oddish when she was a little girl, before it evolved into a Gloom and soon after, into a Vileplume which first appeared in Holy Matrimony!. Multiple Oddish were among the Pokémon seen at Professor Oak's Laboratory in Showdown at the Po-ké Corral and Showdown at the Oak Corral. Two Oddish belonging to two unknown Trainers appeared in Friends to the End during the closing ceremonies of the Indigo League. An Oddish appeared in Pallet Party Panic. Multiple pink Oddish appeared in Team Rocket's fantasy in In the Pink. Ralph and Emily were both shown in a flashback to have once owned an Oddish each in Wherefore Art Thou, Pokémon?. An Oddish was part of an exhibition in Flower Power. An Oddish belonging to the Nursing School appeared in a flashback in Ignorance is Blissey. An Oddish was one of the Pokémon seen at the Pokémon Swap Meet in Tricks of the Trade. An Oddish was one of the Pokémon stolen by Butch and Cassidy in The Fortune Hunters. An Oddish appeared in a Pokémon Center in Beauty and the Breeder along with its Trainer. Two others appeared later as participants in a Pokémon Beauty Contest. Two wild Oddish and one under the ownership of a competitor in the Grass Tournament appeared in The Grass Route. In The Poké Spokesman, Simon claimed to have met an Oddish, Rattata, and Pidgey that could talk, as seen in a flashback. Multiple Oddish appeared in The Power of One, Celebi: Voice of the Forest, and Pokémon Heroes: Latios & Latias. Multiple Oddish were among the feuding Pokémon at Professor Oak's Laboratory in Bulbasaur... the Ambassador!. An Oddish was seen in The Legend of Thunder!. In Talkin' 'Bout an Evolution, one of the Pokémon made sick by Team Rocket's experiments was an Oddish. Several Oddish were among the inhabitants of the Dragon Holy Land in Fangs for Nothin'. An Oddish was seen being fed by Tracey at Professor Oak's Laboratory in Johto Photo Finish. Three Oddish were among the Pokémon troubled by a gang of Haunter in Hoenn Alone!. An Oddish was used by one of the students of the Pokémon Trainer's School in Gonna Rule The School!. Four Oddish appeared in I Feel Skitty!, one of which was owned by Eliza. A photo of an Oddish appeared in A Fan with a Plan. An Oddish appeared in The Ribbon Cup Caper at the ship's Pokémon Center. Multiple Oddish appeared in Lucario and the Mystery of Mew living in the Tree of Beginning. An Oddish appeared in The Saffron Con under the ownership of a Coordinator. An Oddish appeared in Pokémon Ranger and the Kidnapped Riolu! Part One. An Oddish appeared in Camping It Up!. Multiple Oddish appeared in Arceus and the Jewel of Life. An Oddish made a brief appearance in Coming Full-Festival Circle! and League Unleashed!. Multiple Oddish appeared in Zoroark: Master of Illusions as some of local Pokémon that live in Crown City. Three Oddish worked with several other Pokémon to confront Zorua in the park for what Zoroark did to the city. Before a fight broke out, Celebi calms the Pokémon. An Oddish appeared in Mewtwo — Prologue to Awakening. An Oddish appeared in Kalos, Where Dreams and Adventures Begin!. Oddish has made cameo appearances in A Blustery Santalune Gym Battle!, Grooming Furfrou!, Clemont's Got a Secret!, A Battle by Any Other Name!, The Bonds of Evolution!, Heroes - Friends and Faux Alike! and A Fashionable Battle!. Two Oddish appeared in A Jolting Switcheroo!. An Oddish appeared in a flashback/fantasy in The Forest Champion!. An Oddish appeared in a flashback in Diancie — Princess of the Diamond Domain. An Oddish appeared in the book Bonnie was reading in The Clumsy Crier Quiets the Chaos!. Multiple Oddish appeared in Thawing an Icy Panic! in Ramos' ranch. A Trainer's Oddish appeared in Under the Pledging Tree!. An Oddish appeared in Pikachu and the Pokémon Music Squad. An Oddish appeared in A Frolicking Find in the Flowers!. Two Oddish appeared in a flashback in A Watershed Moment!. A Trainer's Oddish appeared in Unlocking Some Respect!. Multiple Oddish appeared in Seeing the Forest for the Trees!, one being seen in a flashback. A Trainer's Oddish appeared in A League of His Own!. A Trainer's Oddish appeared in The First Day of the Rest of Your Life!. Three Oddish appeared in Till We Compete Again!, with two of them under the ownership of a Trainer and the other one being wild. A Trainer's Oddish appeared in Alola to New Adventure!, during a flashback. EP010 Oddish Ash's Pokédex Oddish. This Pokémon is typically found roaming the forest, scattering pollen as it walks around. An Oddish appeared in File 2: Cubone at the Pokémon House in Lavender Town. Two Oddish appeared in File 3: Giovanni. Ash Ketchum owns an Oddish in the manga The Electric Tale of Pikachu. It is one of the few Pokémon that Ash owns in the manga but not in the anime. Oddish first appears in the chapter You Gotta Have Friends. Its capture was not shown, and it instead appears with several of Ash's other Pokémon with a note explaining that "Ash has been very busy since the last comic". 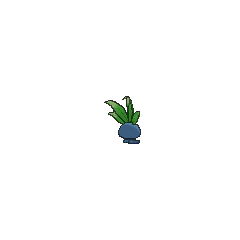 An Oddish first appeared as a silhouette when Green explains about Mew in The Jynx Jinx. In Extricated from Exeggutor, multiple Oddish were some of the Pokémon seen during the mass migration of Pokémon at the Seafoam Islands. They appeared again in a flashback in Really Remoraid, where a Remoraid migration was accounted being similar to their own. Gold owns an Oddish which he keeps at his house in Murkrow Row. Crystal captured an Oddish on her way to Professor Elm's Laboratory in Three Cheers for Chikorita. 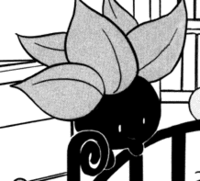 The former illustrator, Mato, used an Oddish in Volume 2 as a self-portrait, continuing to do so until Volume 7. In Out-Odding Oddish, Jet, a notable competitor in the Pokéathlon's Speed Course, used an Oddish to compete with Gold. Green's Oddish debuted in The Big Battle In The Viridian Forest!!. Erika evolved her Oddish into Gloom and then into Vileplume as part of an act. Shū has an Oddish in the Pokémon Gotta Catch 'Em All manga. Burrows underground in the day, exposing only its leaves. It is said to scream loudly if anyone tries to yank it out. Oddish searches for fertile, nutrient-rich soil, then plants itself. During the daytime, while it is planted, this Pokémon's feet are thought to change shape and become similar to the roots of trees..
Moves marked with a superscript game abbreviation can only be bred onto Oddish in that game. 51%-100% HP I'm a Grass type: poisonous and decidedly odd! 26%-50% HP We're in deep trouble. My health is gone by half. Level up Oh! Leveled up! Makes me smile! The leaves on Oddish's head are sharp enough to cut down trees. It attacks by shooting its leaves and letting loose poisonous pollen. Oddish often sunbathes in the Meadow Zone. Her favorite Attraction is Bulbasaur's Daring Dash. He is looking at everyone in the Arbor Area while he's buried in the ground. He doesn't mean to, but he surprises everyone. 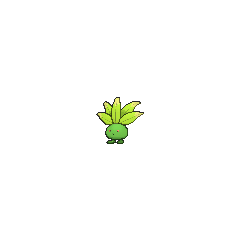 For other sprites and images, please see Oddish images on the Bulbagarden Archives. In Generation II, Bill's grandfather asks the player to bring him a "round, green" Pokémon with leaves growing on its head, referring to Oddish. However, in those games and subsequent generations, Oddish's body (unless it is Shiny) is blue. The mistake might have been a translation error caused by the ambiguity of the Japanese word aoi, which can mean both blue and green. This is fixed in Pokémon HeartGold and SoulSilver. 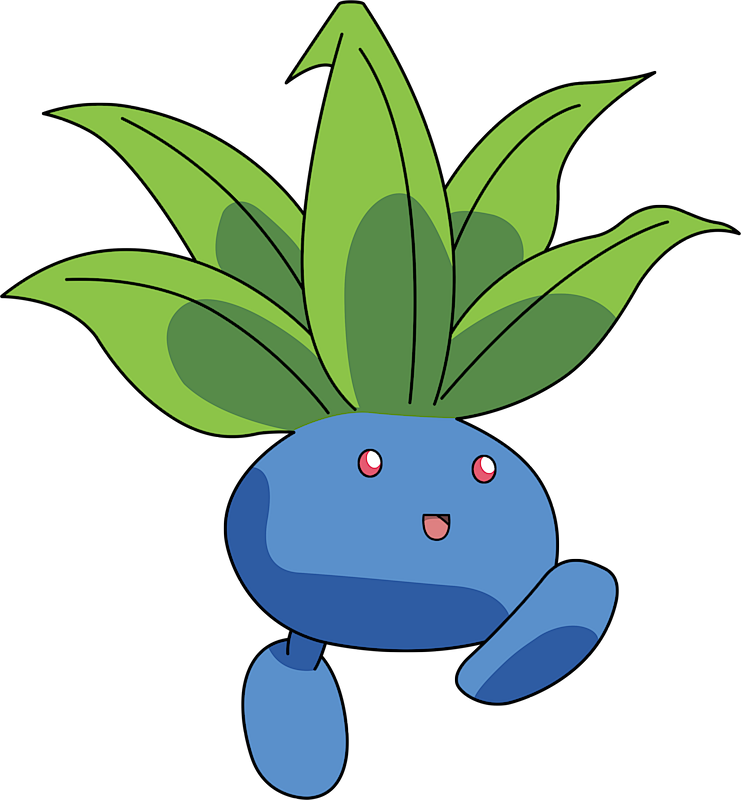 Oddish has a scientific name: Oddium Wanderus, given in its FireRed and Y Pokédex entries. The only other Pokémon with a known scientific name is Kabutops, with Kabutops Maximis. Oddish's alias name is アルキメンデス Arukimendesu, as stated in the Japanese versions of FireRed as well as its Red and Green Pokédex entries. This can either be seen as a corruption of Archimedes, the Greek mathematician, or as a direct reference to a popular Japanese instant noodles brand Archimendes that literally means instant noodles on the go. The latter may reference Oddish's appearance when walking. 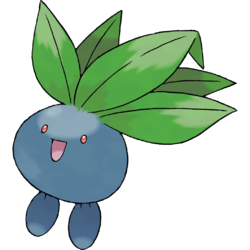 Oddish can be seen as a parallel to Bellsprout. Both are Grass/Poison-type Generation I Pokémon, part of a three-stage evolutionary line, can evolve starting at level 21, and whose second evolutionary event utilizes a Leaf Stone. Oddish is exclusive to Pokémon Red and FireRed, while Bellsprout is exclusive to Blue and LeafGreen, with both Pokémon found in the same locations in their respective versions. Additionally, both can be found at White Forest in White, and both Pokémon have had their Egg designs revealed. 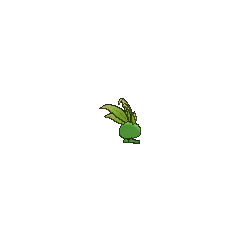 In Pokémon Gold and Silver, Oddish is programmed to be able to learn Charm through breeding, but no other Pokémon in the Grass Group can legitimately learn it to pass down as an Egg Move in those games. In Generation III and IV, Oddish can inherit the move from Shroomish by chain breeding. In Generation V on, Oddish can inherit the move directly from Cottonee. Oddish is most likely based on a mandrake. Oddish is a combination of odd and radish (a vegetable) and a pun on oddish, meaning "somewhat odd." Nazonokusa literally means "enigmatic grass" (謎の草 nazo no kusa). Cantonese Chinese 行路草 Haanglouhchóu Literally "Walking grass"
Mandarin Chinese 走路草 Zǒulùcǎo Literally "Traveling grass"